Unlike many other bus operators, Reading Buses boasts a network of vividly branded buses and employs 410 drivers who are specifically recruited as “people who like people”. Their fleet of 181 buses includes 31 hybrid, 34 gas and 24 Euro6 diesel buses as part of their efforts to improve air quality for the greater community of Reading. In looking to improve overall fuel consumption and reduce fuel spend among other aims, Reading Buses shortlisted a total of seven telematics providers. MiX Telematics was singled out as the only company able to meet their requirements without over-complicating the solution on offer: namely MiX Fleet Manager with RIBAS (an in-cab driving aid) and MyMiX (a mobile app, designed to give drivers direct access to their driving data), a combination proven to drastically improve driver engagement and behavior. By December 2015 – just nine months after the solution was first put to use – Reading Buses reported a 27% reduction in harsh braking and a 44% reduction in harsh acceleration across their fleet. Since fuel consumption is directly linked to the way in which vehicles are driven, it came as no surprise when their overall fuel consumption dropped by 2%, too. 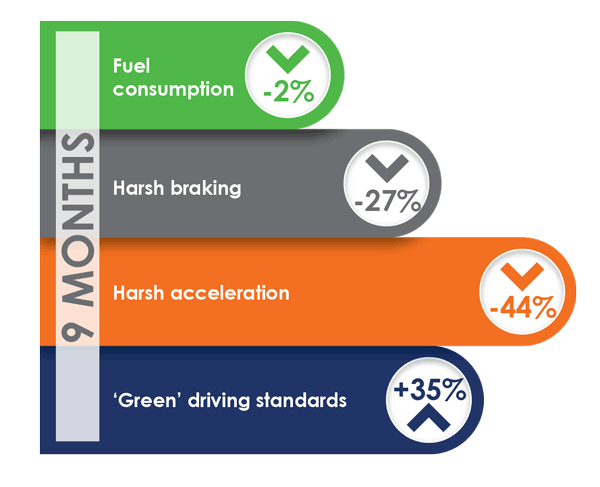 We are also extremely pleased to see a 35% increase in drivers who meet ‘green’ driving standards.